FLORENCE - Harold James Glencross, 62, of Florence (Arizona) died Feb. 19, 2007 at home. Mr. Glencross was born March 22, 1944 in Portland, Ore., and was a son of Harold and Mildred Glencross. He was an Army veteran and a carpenter. He also was a member of Experimental Aircraft Association. He built an airplane and enjoyed watching and flying planes. He enjoyed working with his hands, building and remodeling things. Survivors include his wife, Beverly L. (Callahan); two daughters, Dawn Glencross and Darcie Seales of Elko, Nev.; a stepson, Steven Schmidt of Tucson; two sisters, Wilda Arnoldi of Coeur d'Alene, Idaho, and Beverly Tesky of Osburn, Idaho; and three grandchildren. As Beverly said in her email, "He is going to be missed very very much." Jim Glencross built his Celerity from Larry's plans, completing and flying it in the early 1990's. He was a skilled craftsman and as you can see from the photo, the work on his Celerity was beautiful. He was assisted, we hasten to add, by his loving wife Beverly who recalls the days she helped sandpaper N180JG for its paint job. We extend our most sincere condolences to Beverly and the rest of Jim's family. Yes, we will miss Jim very much! It was shocking to me to hear of Jim Glencross' death, even more so because we're close to the same age, and also of course because you just know you're going to miss a great guy like Jim so much. After a round of health issues prevented Jim from getting his FAA medical reinstated, it was sad seeing his airplane languish under wraps on the trailer he used to bring it down from Idaho a few years ago. Happily, N180JG now has a new owner who was fortunate to live nearby and who was ready to take it over. (See story, below) Nevertheless, it was terribly saddening to us pilots that in the last years of his life, Jim was unable to fly this beautiful airplane that he had so lovingly crafted. But fortunately, he did get to fly it in the 1990s while still living in Idaho. From conversations I had with him during that era, I learned that it flew very well and was a fantastic performer. To us fellow pilots and fellow aircraft builders Jim achieved a great deal, probably more than many of us will do in our lifetime, which of course is building and successfully flying his own airplane. This is a dream that even pre-dates the Wright Brothers, one shared by literally hundreds of thousands of fellow aviation buffs around the world. Just imagine for yourself, if you haven't had the pleasure yet, that singular day when your own aircraft, created by your hands in your shop, takes to the air for the first time! That experience, like your first solo flight, is something you can never duplicate no matter how long you live. It behooves those of us who are still living to relive our aviation dreams, and to rededicate ourselves to that glorious "homebuilder's dream" we have probably had in our hearts for many years. Our days on earth are numbered, and we must set our own priorities to make best use of those days, hours and minutes, as we see fit. At a time like this, for all of us who have dreamed of creating and flying our own airplane, the death of a colleague can serve as a wake-up call. It's a gentle reminder for all the rest of us. We should look where we are now, and figure out how we can get to where we want to be in the future. Make yours "A life lived well!" N180JG, the Jim Glencross Celerity, arrives at its new (temporary) parking space. Eldon, As you know, I have been in contact with Beverly Glencross, whose husband Jim has recently passed away. Beverly let you know that she wanted to sell Jim's currently disassembled Celerity and you immediately thought of the only person near enough and crazy enough to be interested. Since I have recent experience moving projects across the country, an in-state move here in Arizona was a walk in the park. 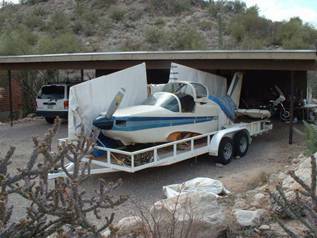 Jim had very carefully loaded his plane on a trailer in order to bring it down here from Idaho. This airplane is beautiful from any angle! Another builder's workshop; Are we ready to do it again? 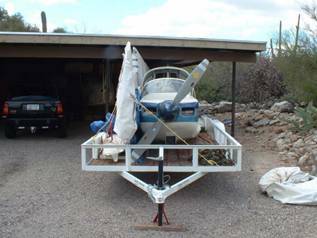 Don O'Rourke has suggested that we have another builder's workshop, offering space at his spacious shop located at Pinal Air Park northwest of Tucson. 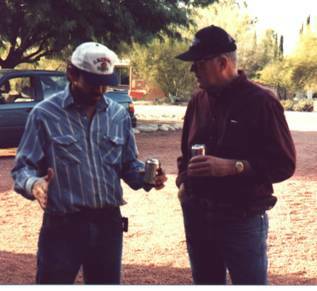 Some of you will recall the builder's workshops we have had in the past here in Tucson, before my full-time job began made it difficult. But now I'm retired! (feels good too) The first workshop that we had was sort of a spur-of-the-moment thing. Three of us (Bernie Hettinger, Farrell Pettitt, and I) built a main wing spar for Bernie's airplane project. We did most of it anyway. I had it drum-sanded true and to final thickness at a local mill before shipping it off to Bernie in Illinois. The next year, between Christmas and New Year's, about 6 to 8 builders came to share experiences, good and bad, and to practice some basic fiberglass application. We had a lot of fun and capped the affair by all going out to a steak house together. The next workshop was our largest I believe. Here are pictures showing most of the happy participants (everybody smiled! ), some of us still wearing the dust from sanding the foam and fiberglass as we built a set of wing leading edge fuel tanks. Yes, we had steaks again! Our past workshops have always been held around New Year's, after builders have been able to celebrate Christmas with their families. 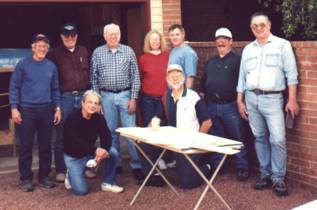 I am asking all interested builders to get back to me on this, that is, if you want to have another Builder's Workshop in Tucson. We have plenty of time to prepare, and I will update you later in this newsletter with specific information concerning lodging and other items. My tentative plans are to have workshop participants apply foam and fiberglass to fully enclose a wing. 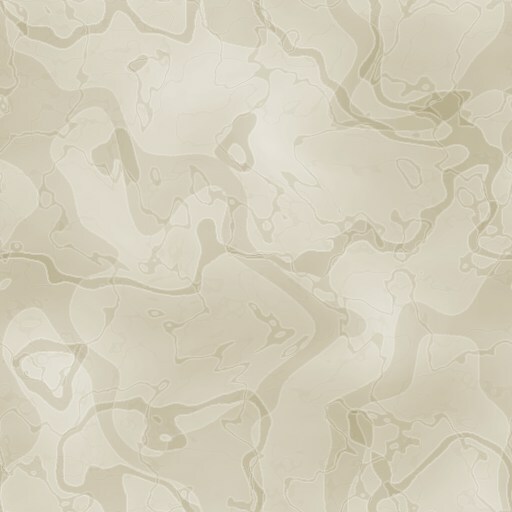 Hopefully we would also have time to move on to the application and dressing (block sanding) of fiberglass filler compound. Do you think that three days of workshop time would be adequate? Please get back to me with your thoughts and ideas on timing, suggested activities, etc. Thank you. Evaluating an existing project. What should the builder be wary of when looking to buy a partially completed project? With the change of ownership in Jim Glencross' aircraft fresh in our minds, perhaps this would be a good time to review some of the things to watch out for when purchasing a project from another builder. O'Rourke had the advantage of purchasing an airplane that had flown off its test hours, which tells a lot about the quality of materials and workmanship. The project that you find for purchase may not have such a history and should be looked over more carefully, as follows. Evaluate your own situation vis a vis the project you are looking at. Do you have enough space for it, where you can keep it protected from the elements (sun, wind, rain, pack rats, etc.)? Suggestion--sometimes portions of a project can be safely stored in rental storage while you work on a major component in your own shop. Look at the workmanship and the materials used. Were the plans followed by the builder? If non-certified materials were used (i.e.-Port Orford Cedar from a mill rather than Sitka Spruce from Wicks Aircraft Supply or Aircraft Spruce and Specialty Co.) does the wood meet the FAA's requirements for the number and orientation of growth rings per inch, knots and pitch pockets, etc.? 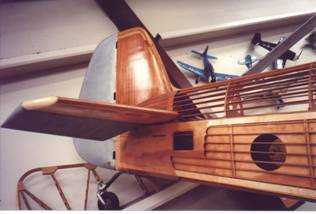 If you don't know what I'm talking about, have an A&E mechanic or experienced and knowledgeable wood aircraft builder look over the project for you. Also, are the glue joints uniform, with a small amount squeezed out on all edges indicating thorough glue application? Is any wood cracked or broken? Are any metal parts corroded? Evaluate the overall storage history of the project. Was care taken to protect all the components? Are fiberglass and foam intact? Has unprotected wood been allowed to rot anywhere? Suggestion-tapping wood surfaces with a quarter will reveal hollow sounding areas that may be evidence of dry rot. Look carefully at the installation of hardware such as landing gear, hinges, bell cranks, rudder assemblies, etc. A common flaw is distended hardware mounting holes drilled through the wood, where the builder failed to fill (with Rock Hard Water Putty or equivalent) and then redrill a bad or misplaced hole. These can be fixed, just be aware that they may exist. Critical mounts (wing mount brackets, engine mount brackets) should have snug through-bolt bushings made from steel tubing epoxied securely in enlarged mounting holes. The engine's health may be difficult for you to accurately determine, especially if you cannot feasibly run the engine. It is difficult to even do a compression test on an unmounted aircraft engine. Perhaps all that you can do is carefully inspect the log books for the engine and prop to learn the installation and maintenance histories, time since overhaul, etc. Remember, seals tend to dry out and leak after several years of storage, especially constant speed prop seals. Instrumentation, wiring, hydraulics, and the like should also be inspected. The biggest danger with stored instruments is environmental, that is, the environment they are stored in--moisture, heat, dirt, etc. Also, instruments may be warranted, but if they're stored a long time before installation the warranty may have expired before you even get to install and use them. Some manufacturers count the warranty as starting the date of the sale, others the date of installation. Check with the manufacturer if you are unsure and feel that you need to know. If you want to have your project fall under the 51 per cent rule so you can get an aircraft mechanic's and inspector's license for that aircraft, you may have to talk to the FAA representative in your area. I have heard of cases where an airplane that needs instruments and radios installed, needs painting and an interior, has been judged to have been more than 51 per cent completed by the builder who finishes the project. But I think each case has to be judged on its own merits. It helps a lot of the construction to date has been documented with photos and log entries. Hopefully all of this information has given you a template to look at any project out there. Besides all that, talk to people and get all the info that you can, and good luck!